Greetings everyone, we are back on the highly underestimated Project Chekov. Definitely having fun doing it, but it is a struggle to stay on top of. Speaking of that, this little bird on top of a birdhouse has caused a little bit of a headache. Back in June 2011 (told you I was behind) Linda and I went to one of our favorite local birding sites in Jubilee College State Park. They have a pond there that tends to attract a wide variety of birds and dragonflies and animals and hell spawn MOSQUITOES – all good things come at a price I guess. While we were there, this little bird decided to come out and pose for the cameras. Want to know beside Sparrows what other birds I have difficulties with? … you guessed it, this bird! 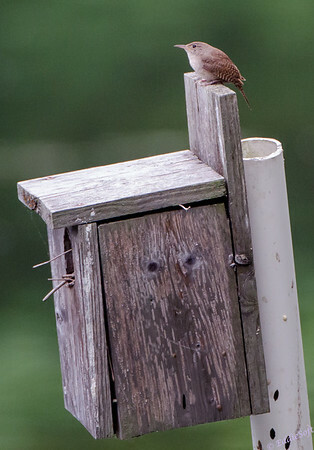 They are small and brown with some gray – yeah, normally I would call it a Sparrow and move along but these are smaller, have a more tapered/thinner tail and probably more distinguishable thin down turned bill. This is the point where I throw up the Wren sign instead. 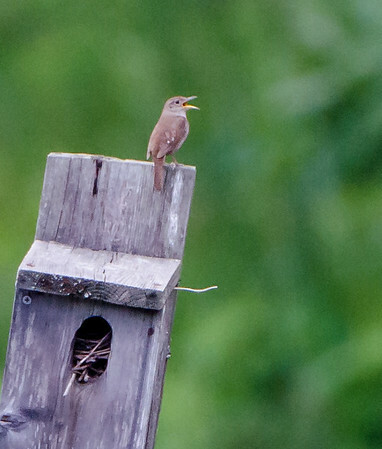 Hit the jump to see a few more shots of this Wren and the other featured bird for this post! Oddly enough, none of these pictures show the classic upturned tail commonly associated with the Wren. However, the speckling on the side wings and the profile give me pretty good confidence I’m in the right ballpark. Going a level of classification down from that is when it really gets tough. 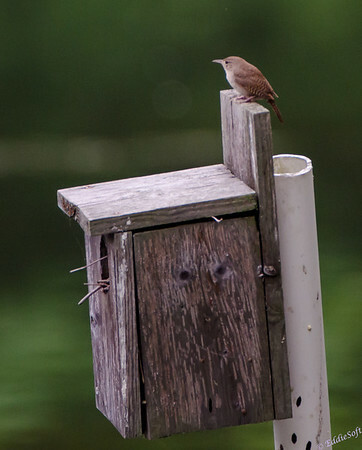 Based on the light eye liner and the softer lines in the wings, I’m going to go out on a limb and call it a House Wren. 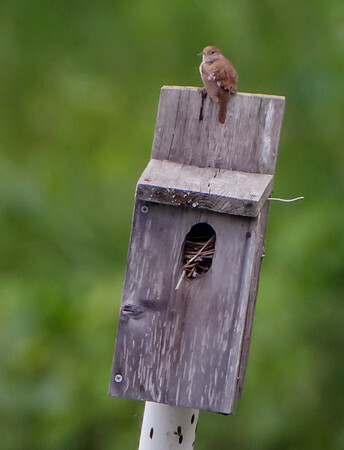 Update: now have confirmation from the Illinois Birding Facebook page that this is indeed a H0use Wren (thanks Linda). With that assumption, Wikipedia refers to this bird as one of the most widely distributed birds in the Americas. What was throwing me off some is Cornell’s site mentioned they home in open forests, forest edges, and areas with scattered grass and trees. Granted we were in a forest, but this bird house was sitting in the middle of a pond. 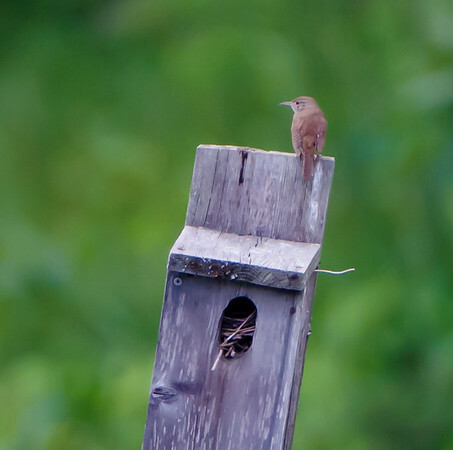 Having read all of the information Cornell and Wikipedia have on the House Wren I was still left wondering what they ate – backing up to a more general Wikipedia entry on just Wrens it became apparent they are insectivores. This makes perfect sense based on where we were at with the abundance of Mosquitoes. It also mentioned that their predators include cats, rats, opossums, foxes and squirrels etc. – based on that we should sign this bird up for Mensa having picked this ideal spot to nest – no threat from those out in the middle of the water! Making their debut, let’s all extend a hardy welcome to the House Wren providing me another check on the bird list – yeah! 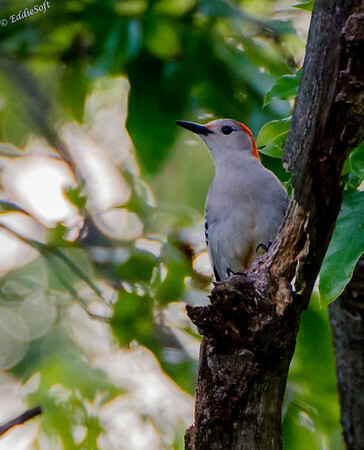 Now on to a group of birds that are much easier to identify … the Woodpeckers. Again, another one of those bird named by Mr. Obvious seeing as how they do indeed peck at the wood – how clever. But, to throw me off, they referred to the bird in the shots above and below as the Red-Bellied Woodpecker because there is red on their belly.. err scratch that. These birds are abundant in our neck of the woods. If you can’t locate them from their unique callings (much deeper than you would expect) just listen for the sound of wood being hammered to pieces. I’ll let you in on a little secret – these birds may act like their constantly searching for insects for nourishment.. but I often see them snitching seeds from our feeders. 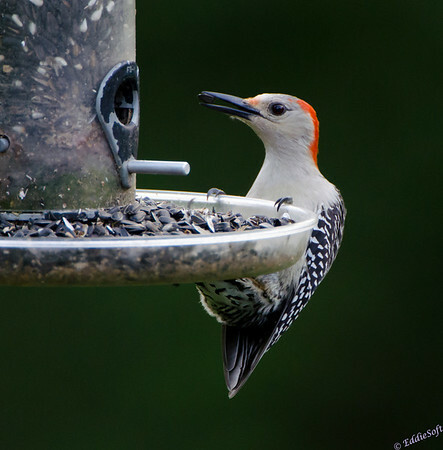 If you recall, The Red-Bellied Woodpecker visited me while on the Jubilee Hike posted back in June of last year (link here). Oh, and a few more shots enjoying the feeder back in 2008 (link here). This isn’t the only Woodpecker that frequents our feeders. 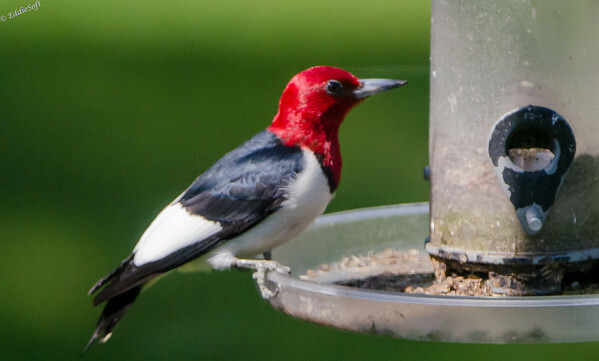 Yes, the Red-Headed Woodpecker (at least they got the name right with this one) also shows up from time to time looking for Sunflower seeds. Think this one was pretty disappointed the feeders had not been fill yet. The following shot isn’t the best, but wanted to give you a good look at the back coloring. The Red-Head is rarer in these parts than the Red-Bellied version so it is always a treat when we spot one visiting the backyard. Now technically this particular has popped up on the blog previously, but talk about some HORRIBLE execution (link here). These two shots are not the best, but definitely raises the bar over those previous Juvi shots (admittedly, at the time I wasn’t sure what it was). 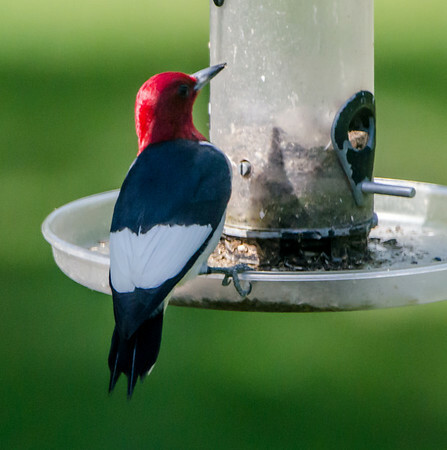 Word has it there is a giant Red-Headed Woodpecker in Peoria Heights, IL. Next time you are around there, take a walk around their downtown area – people say it can often be found hanging on their fire tower… no need for binoculars – that bird is HUGE. That’s all for today folks – catch you again real soon.